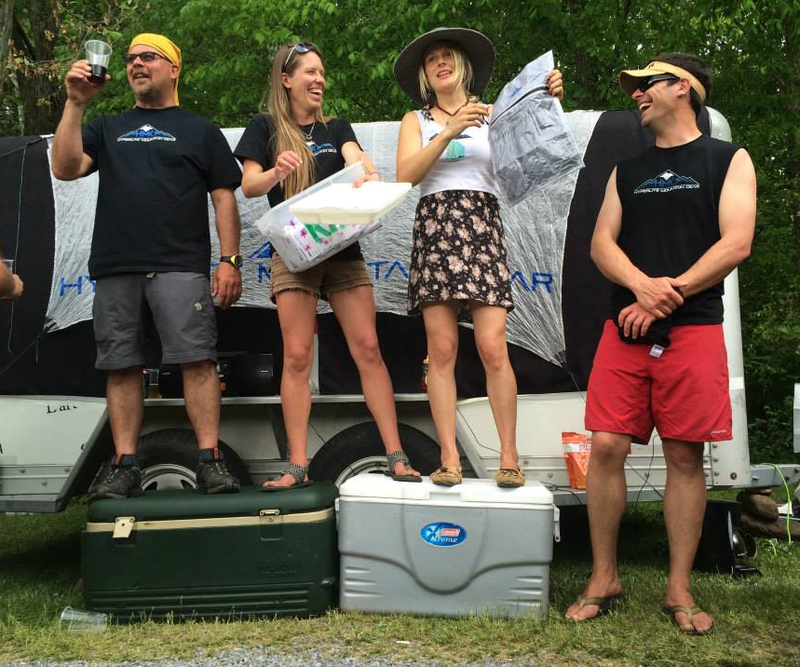 The Trail Days Ambassadors: (L to R) Porter Laclair, Annie MacWilliams, Angela VanWiemeersch and Brian Threlkeld. 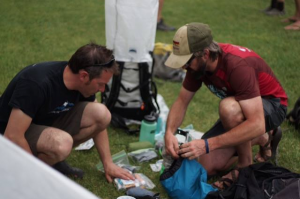 Hyperlite Mountain Gear recruited a variety of expert thru-hiker and/or multi-sport adventurers to work the Trail Days 2015 booth alongside our President and Founder Mike St. Pierre. Between them, they have hiked, climbed, rafted or otherwise traveled through the backcountry tens of thousands of miles. In this year’s wrap-up blog post these athletes reflect on the importance of events like Trail Days. Check out a full album of Trail Days photos on our Facebook page. 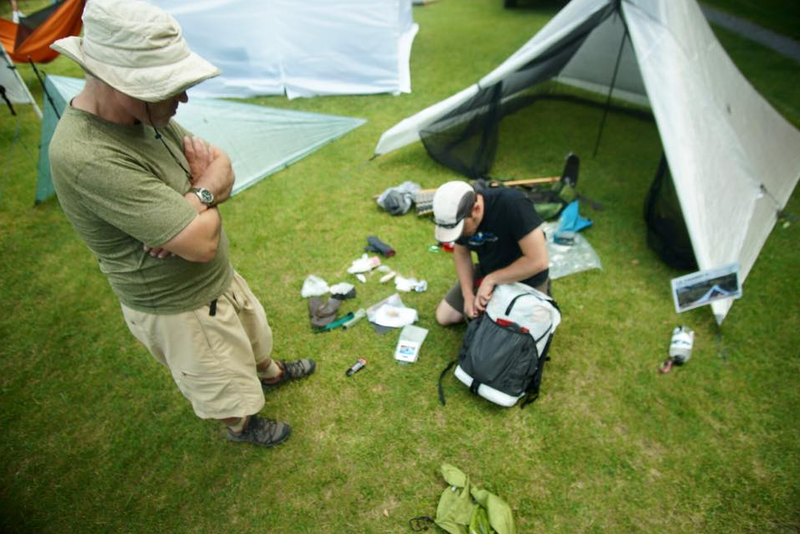 According to Mike St. Pierre, first and foremost, Trail Days offers outdoor adventurers and thru-hikers the opportunity to see the most groundbreaking gear in the industry. Mike St. Pierre helps Patrick lighten his load with a “shakedown”. At least 150 people showed up for Saturday’s raffle. But Trail Days is not just about gear, he added. 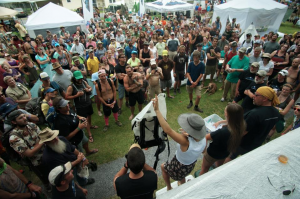 The event raises awareness for the amount of work it takes to maintain the Appalachian Trail, it educates people on Leave No Trace principles, and it brings together a trail town, trail maintainers, the organizations involved in managing the trail and hikers. And it’s a really good time. According to Triple Crowner Annie MacWilliams, who thru hiked the AT southbound in 2009 and did the Pacific Crest Trail (2011) and Continental Divide Trail (2013): “The best part of Trail Days is the overwhelming support for the Trail, the hikers and the experience of being in the woods. It’s really fun to go to an event to see a hugely diverse crowd of people that are supportive and inclusive of everyone, based on the common interest of walking outside.” Plus, it gives like-minded people the chance to stay connected. 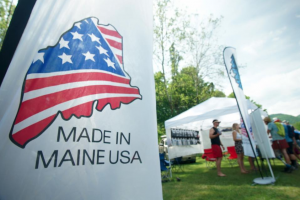 95% of our product is made and manufactured in the United States. MacWilliams agreed: “Often I fall out of touch with hikers over the years as life carries on, but then you might cross paths with them on a later trail or while traveling the country. 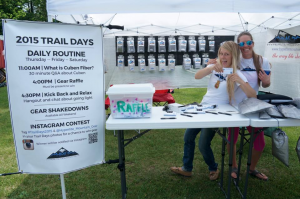 But the community continues to be important to me.” Trail Days is one of those signature events that bring more than ten thousand thru hikers to one spot each year. For Laclair, the AT was the ultimate social experience. Armed with $25,000, he and his partner, Pace, hiked 25+ miles per day so they could hit a pub every four days. There, they not only sampled the local beer, but also bought rounds for all thru hikers. Plus, they left town every night with four liters of boxed wine to share with fellow hikers. Laclair has worked at the Hyperlite Mountain Gear booth for four years because of the overwhelming positive energy and enthusiasm people have for the Appalachian Trail and the tight-knit community of thru-hikers, day hikers, section hikers, trail angels and others who attend. Angela and Annie at the booth. Hiking the Appalachian Trail, all agree, is a life-changing experience. Though Hyperlite Mountain Gear Ambassador Angela VanWiemeersch hasn’t done it, she understands the dedication it takes to live, unsupported in the wilderness for months at a time. Among other things, she paddled 430 unsupported miles along the Mackenzie river in the Northwest territories of Canada and became the first woman to free solo Ham and Eggs on the Moose’s Tooth 3000′. Shakedown with Mike St. Pierre. The post Trail Days appeared first on Hyperlite Mountain Gear Blog. Get updates like this delivered straight to your inbox. And don't worry, we don't spam — even our emails are ultralight. We use our mailing list for brand updates, promotions, and marketing. © HYPERLITE MOUNTAIN GEAR. ALL RIGHTS RESERVED.